Which edition of Rundeck would you like to download? Rundeck Community is the open source project. Community supported. 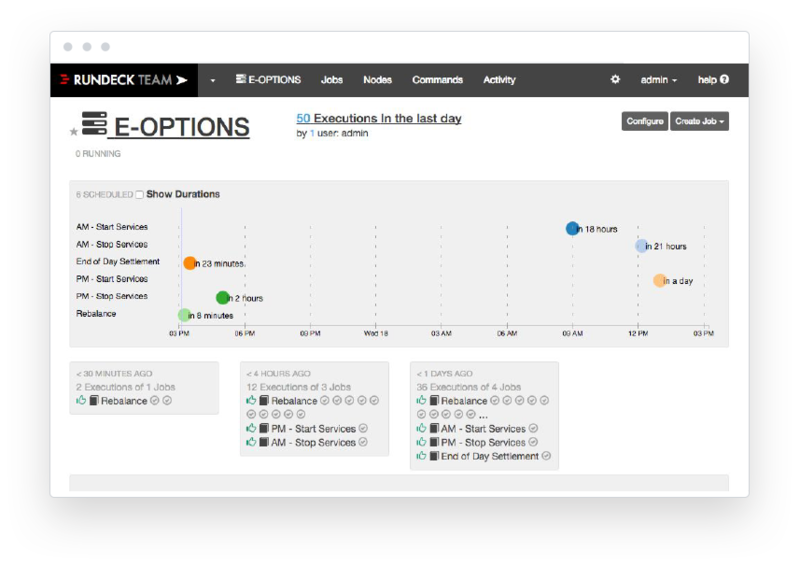 Rundeck Enterprise includes enterprise-grade management and security features, professional support and personalized training. Rundeck is built for today’s diverse and fast-moving environments. A Rundeck Enterprise subscription gives you the enterprise features, scalability, and support you need to get the most out of your Rundeck usage. Learn more about Rundeck Enterprise. New to Rundeck? Here are some key concepts. A management concept that helps you group jobs. Think of them as workspaces. The workflows you define and execute. Projects are made up of Jobs. The individual actions that make up a workflow. The remote endpoints on which a step executes.